Ford has changed almost everything about the Sport Trac for 2007. Essentially, a Ford Explorer with a pickup bed, the Sport Trac has grown in length and in width for 2007, and this has translated directly into more room inside for people and out back for cargo. A new V8 engine is available that generates 292 horsepower along with an equally new six-speed automatic transmission. While this has kicked performance up a notch or two, just as important is what it's done for payload and towing capacity; a V8 4×2 Sport Trac is now rated to tow up to 6800 pounds. A mildly re-tuned version of the 4.0-liter V6 is also available and it comes with a five-speed automatic. Both engines are available with two- or four-wheel drive. Styling has been updated and refreshed, bringing the Sport Trac firmly back into the family of Ford light duty trucks. All this attention to mechanicals and sheetmetal doesn't mean creature comforts have been ignored. Redesigned seats are lighter and take up less room. A streamlined instrument panel and dash present a friendlier, easier to use array of controls and displays. The 2007 Ford Explorer Sport Trac is a four-door, five-passenger, midsize pickup. It was unique when it first appeared in 2000, but today must compete with midsize four-door pickups from every major player. Even Honda has entered the truck business with its Ridgeline, a unique vehicle in looks and construction with groundbreaking features. Ford has legacy, though, and a faithful following. For these, the new Sport Trac should be welcome, if a bit overdue. The price, as much as $2000 less than the 2005 model, should help, too. 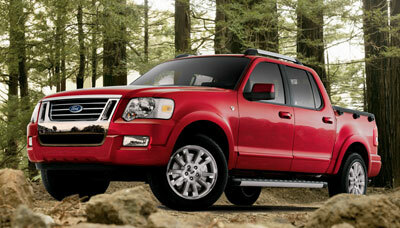 The new 2007 Ford Explorer Sport Trac comes in two trim levels, the XLT ($24,245) and the Limited ($25,845). Four-wheel drive is available for both the XLT ($26,740) and the Limited ($28,340). The 4.0-liter V6 with five-speed automatic transmission comes standard on both trim levels. The 4.6-liter V8 is an option for both trim levels ($1200) and comes with a six-speed automatic. The XLT comes standard with cloth upholstery, manually adjusted bucket seats, 60/40-split bench seat in back. Manual air conditioning is standard. Tilt steering wheel and cruise control are standard, as are power windows, door locks and foldaway, outside mirrors, and an AM/FM/CD/MP3 stereo. Heavy duty Berber floor mats dress up the utilitarian, rubber floor covering. A Class II hitch is standard, as are roof rails and P235/70R16 tires on cast aluminum wheels. Options for the XLT include a six-way, power driver's seat ($295); an Audiophile stereo adding an in-dash six-CD changer, subwoofer and auxiliary input jack ($510); a navigation system incorporating the Audiophile stereo ($1995); Sirius Satellite Radio with a six-month, pre-paid subscription ($195); leather-wrapped steering wheel ($75); embedded wire-heated windshield ($300); power tilt-and-slide moonroof ($850); power adjustable pedals ($125); Appearance Package ($795) with fog lamps, side step bars and P245/65R17 tires on cast aluminum wheels; Convenience Package ($250) with door entry keypad, auto-headlights and auto-dim, inside rearview mirror; aluminum cargo bed extender ($195); two-piece, lockable, cargo bed hard tonneau cover ($595); roof rail cross bars ($60); and Class III/IV trailer hitch with seven-pin wiring harness ($150). Options on the Limited for the most part mirror those offered on the XLT, but some of what's optional on the XLT comes standard on the Limited. The Limited comes standard with a leather-wrapped shift knob and P235/65R18 tires on machined aluminum wheels as original equipment. Sundry exterior trim pieces that are painted black on the XLT change to body color or silver on the Limited. Options include leather-trimmed seats, front and rear, with a 10-way, power driver's seat ($995); a Convenience Package with door entry keypad and auto-dim, inside rearview mirror ($195); and an Electronics Package with dual-zone, automatic climate control, four-line information center and steering wheel-mounted controls for air conditioning, cruise and audio ($570). Safety features that come standard on all models comprise the required front airbags and child safety seat anchors (LATCH) plus Advance Trac stability control; front seat-mounted side airbags to protect the upper body in side impacts; four-wheel antilock brakes; and tire pressure monitors. Safety Canopy side-curtain airbags with extended inflation to protect the head in side impacts and rollovers are optional ($560). If the 2007 Sport Trac looks larger than the '05, and very much like the 2006 Ford Explorer, that's because it is, and because it does. At least from just behind the front doors forward, that is, all of which it shares with the current Explorer. This is part of Ford's plan to push brand identity, and why the fronts of Ford's light duty trucks, be they pickups or SUVs, wear many of the same design features, including the chrome-framed grille, bumper centerpiece and lower air intake. And the full, wraparound, body-color lower fascia above the blacked-out front air dam. And the signature, geometric housings for the compound headlights/running lights. It's also two inches wider than the '05 Sport Trac; in track (the distance between the tires side to side), too, giving the new Sport Trac more bulk and a more confident stance. It's in length that the 2007 Sport Trac changes most dramatically. Wheelbase (distance between the tires front to rear) extends by almost five inches, overall length (bumper to bumper) about the same. Oddly, in these two measures the new Sport Trac also surpasses the Explorer, by almost 17 inches in both. Thus, while the Explorer is the more people-oriented of the two, the Sport Trac's longer wheelbase promises a less choppy, more controlled ride. Curious. The Dodge Dakota Quad Cab alone exceeds the Sport Trac in wheelbase and overall length, by less than an inch in the former but by more than eight inches in the latter. Of the remaining four-door, shorter-bed (the Sport Trac's bed is four feet long, the rest around five feet), midsize pickups, the Chevrolet Colorado, the Honda Ridgeline, the Nissan Frontier and the Toyota Tacoma measure between three and four inches shorter overall. Only by parking the '07 Sport Trac next to the '05 are the differences in their lengths apparent, as the stylists have retained the proportions between cabin and bed. What extra expanse there is along the '07's flanks has been dedicated to wider door openings over blank sheetmetal. More defined and more sharply creased wheel openings further de-emphasize the added length. From the rear, well, what else can be said. It looks like a Ford pickup. One distinctive aspect is that the sides of the bed and the tailgate rise as much as three inches higher than is the norm in the segment. While this increases the space enclosed by the bed, it definitely makes hefting boxes and bags up and over into the more of a strain, a painful trait it shares with the Honda Ridgeline, with sides only a half-inch shorter. By making the Sport Trac look taller, it also raises the Sport Trac's visual center of gravity, although the wider body and wider track help some to reduce this impression. Inside, the 2007 Ford Sport Trac looks a lot like the Explorer cabin. Not that it lacks anything by way of necessities or has been saddled with an abbreviated option list, but there's more borrowed than new. The Sport Trac shares virtually all of its interior, from trim to seat frames, with the Explorer. As far as the instruments go, this is good. Ford has cleaned up these elements nicely. They're less busy, quieter, easier to scan and use than those in the previous-generation model. Fuel and coolant gauges could be larger and located closer to line of sight than tucked away in the lower, outer quadrants of the tachometer and speedometer, but otherwise the instrument cluster is a delight in its simplicity. Same for the center stack, which although packed with functions, is intuitively organized, with readily deciphered controls and displays. We still long for a tuning knob instead of the Sport Trac's slow scanning rocker switch. The optional navigation system pushes the audio controls to the side and either gangs some functions or transfers them to the LCD screen. It's still a clean look, though, and the vent registers stay where they were. The only real concern here is with the number of components making up the dash assembly. The fewer the components the better, generally speaking, to reduce the number of squeaks as the miles pile up, and the Sport Trac's dash has one of the highest counts we've seen. Seats are comfortable, although the bottom cushions front and rear could provide more thigh support. Room in the rear doorways for feet when climbing in and out is cramped, but once inside, there's decent area beneath the front seats, which have been re-worked to save weight and space. All five seating positions get three-point seatbelts, but only the front seats and the outboard rear seats get the adjustable, full-size head restraints. Comparatively speaking, the '07 Sport Trac's interior lands squarely in the middle of the segment. The Nissan Frontier and Toyota Tacoma have a few tenths of an inch more front seat headroom, the Honda Ridgeline almost an inch. The Frontier and the Ridgeline are tops in rear seat headroom, but again by only tenths of an inch. The Chevy Colorado has an inch and a half more front seat legroom but almost two inches less rear seat legroom. The Ridgeline wins in hiproom, by about two inches front and rear, the Frontier offers fully two and a half inches more rear seat hiproom and the Dakota squeaks in with a half-inch more hiproom all 'round. Storage is about what's to be expected. The glove box is adequate. The front center console hosts two cup holders adjacent to the shift gate. Two more for the rear seat fit behind the hinged, padded top to a deep and wide bin between the front seats. The front door map pockets have a space for a water bottle molded into the hard plastic enclosure. Back in the bed, a shallow, covered bin running the width of the floor is placed inconveniently all the way forward and thus out of reach from the tailgate, and a small, covered bin is recessed in the floor at each side behind the wheelhouses; good ideas, but not nearly on a par with the Ridgeline's lockable, 8.5 cubic-foot trunk in the floor of the bed aft of the wheel housings. On the other hand, with the Sport Trac's optional, two-piece, lockable, hard tonneau cover in place, the enclosed volume of the cargo bed measures 37.5 cubic feet, up from the '05's 29.6 cubic feet. Rearward visibility is somewhat limited by the high bed, particularly with the hard tonneau cover. The new powertrain used by the 2007 Ford Sport Trac is a major plus. So are the improved driving dynamics resulting from a stiffer frame adapted from the current Explorer, the longer wheelbase, the wider track and, certainly not least, the all-new, independent rear suspension. So much has changed, in fact, it's almost not fair to compare the new with the old. Suffice to say, then, that the new fixes just about everything that was wrong with the old. Power from the optional V8 is at or near the top of the check list for most pickup buyers. In horsepower, Ford's V8 sweeps the class, including the Dodge Dakota's 260-hp, 4.7-liter, high-output Magnum V8. And without paying a significant premium at the gas pump. The Sport Trac's V8 EPA-estimated 14/18 city/highway miles per gallon easily beats the Dakota's top V8 in fuel economy ratings. The Frontier's 265-hp V6 betters it by 1 mpg in city driving but only equals it in the highway estimate. The Tacoma's 236-hp V6 earns an estimated 17/21 city/highway, the Ridgeline 16/21 city/highway. Topping them all, no surprise, is the Colorado's 220-hp inline-five, at 18/23 city/highway. Much the same holds for torque, where the Sport Trac's V8 trails only the Dakota, and by a mere 10 pound-feet. How all this responds when the gas pedal is pressed isn't quite as impressive as the data suggest. (Those data are 292 horsepower and 300 pound-feet of torque.) Power comes on smoothly, yes, with no discernible phasings from the variable valve timing. But the torque peaks at a relatively high engine speed (3950 rpm), and while the six-speed automatic's lower gears work well in getting the engine up into its power curve for launching from a stop light, once underway, it doesn't answer the call for more power as promptly as expected. From a refinement standpoint, the engine feels somewhat metallic and there's a tiny jolt every time you take off from a stop as the slack in the driveline is taken up. Brake pedal feel is solid, if not really firm, and the ABS keep everything under control in panic stops. Ride quality is smooth and well damped, traits not widely shared by the live axle-outfitted competition. The Sport Trac has an independent rear suspension, a design associated with sports cars, a smooth ride and good handling. Indeed, the Ridgeline is the only other truck in this class with an independent rear suspension. Drive over seriously potholed or broken pavement and you're reminded you're in a truck, but it's good by pickup standards. Directional stability is good. Steering response is quick, considering the weight of the vehicle. Understeer, where the truck wants to go straight instead of turning, is the default mode if a corner is entered whilst carrying too much momentum. In those cases, the electronic stability control helps keep things under control. Body lean is relatively controlled in corners. The Sport Trac feels a bit more confident in quick direction changes than the Honda Ridgeline, which is quite as sure-footed. The Dakota and Tacoma closely match the Sport Trac's planted feel. The Sport Trac offers the tightest turning circle of the bunch, almost four feet tighter than the next-best Tacoma's and seven-and-a-half feet inside the last-place Chevy Colorado's. That's important when making a U-turn or in crowded parking lots and other tight quarters. We haven't yet driven a V6-powered 2007 Sport Trac. It makes a bit more power than it did in its previous incarnation. The new model weighs nearly 500 pounds more than the old one, however, so we suspect that extra power won't be adding much punch, if any, to the 2007 model's performance numbers. On the upside, the new model enjoys all the other improvements, so save for speed and quickness, we expect it'll have much the same ride and handling dynamics as that of the V8. The 2007 Ford Sport Trac refreshes and updates the original in every way that matters. It's roomier. It's more powerful. It rides and handles better. It hauls and pulls more. All this comes at a lower price and with more features. In our book, this equals better value. That's hard to beat. NewCarTestDrive.com correspondent Tom Lankard filed this report from Laguna Beach, California. Head/hip/leg room, f: 39.8/55.4/42.4 in. Head/hip/leg room, r: 38.5/55.5/36.9 in.